Dowco's outdoor living professionals make sure that your lawn is manicured on a weekly basis, traveling in opposite directions, to give you that angle cut that you desire! 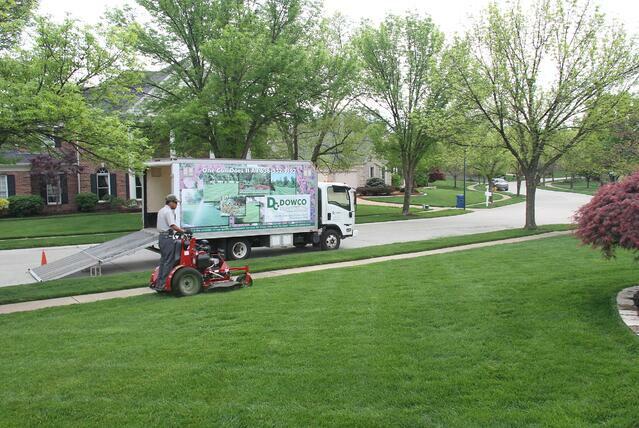 Lawn mowing in Chesterfield, Missouri begins in late March or early April. Many people wonder if grass clippings are beneficial or harmful for their turf. Dowco returns the grass clippings to the lawn instead of bagging them because they are a valuable source of fertilizer for your grass plant. While they decompose on your lawn they provide nitrogen, potassium and phosphorus. The clippings are composed of primarily water and they decompose more quickly than the rest of the grass plant. Research at MU and other universities indicates that clippings do not contribute to thatch buildup on any cool- or warm-season grasses, including Zoysia. There is a point where too many grass clippings can become harmful for your lawn, which is why it is important to mow regularly. For Chesterfield, we recommend mowing every 5-10 days. There are a lot of variables that can change the mowing recommendations. Whether or not you have an irrigation system, recent precipitation or lack of, and fertilizers are just a handful of those factors. Dowco prefers to mow at a relatively high setting so that no more than 1/3 of the grass plant is removed during lawn mowing. The best mow height for Fescue turf is 2 ½ - 3 ½ inches. Grass is always mowed at the appropriate height for the season with sharp blades. At no point is more than 1/3 of the grass plant removed. 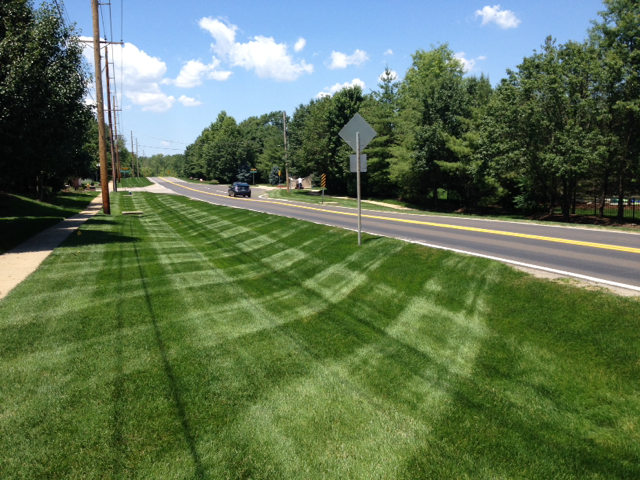 Our Chesterfield lawn mowing professionals trim sidewalks and trim around obstacles weekly. Grass on paved areas is blown off. All concrete curbs will be edged weekly. Generally your lawn will be mowed on the same day of the week by the same crew. During periods of peak growth we work hard to provide clump free turf and will double cut as needed. When the leaves fall we install mulching “gator” blades on our mowers that aid to break down the leaves and return nutrients to the soil. As the seasons change we gradually lower our mowing height. Your final mowing is lower allowing neighboring leaves to blow over and not accumulate on your lawn. We mow the grass at a seasonally appropriate height. We'll also mow at different angles, when possible. We string trim all obstacles including fencing, mailbox posts, etc. We'll pick up trash, newspaper, & toys before starting work instead of shredding it with our mowers. Our blades are sharpened EVERY night, not just once per week, for a fresh and healthy cut at each property. We edge concrete boundaries weekly, not as needed. Our top quality edging is done by a stick edger, not a weed eater. Before we leave, we blow off all paved and hard surfaces. This includes upper decks, patios & balconies. We're reliable and we aim to be there on the same day of every week. If this isn't possible due to holidays or weather, you'll receive an email. We also provide leaf cleanup and removal for our clients in the fall. Trust the professionals at Dowco to manicure your lawn to perfection with our lawn mowing service!